After the coup, human rights violations, restrictions of basic liberties, and restrictions to press freedoms, have been everyday occurrences. Social Watch Honduras is comprised of grassroots organizations that promote womens´ rights and gender equity. 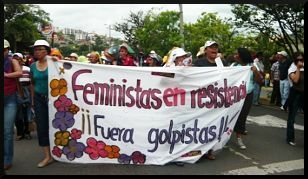 These groups have been mobilizing actively against the coup d´etat from a gender-based perspective.